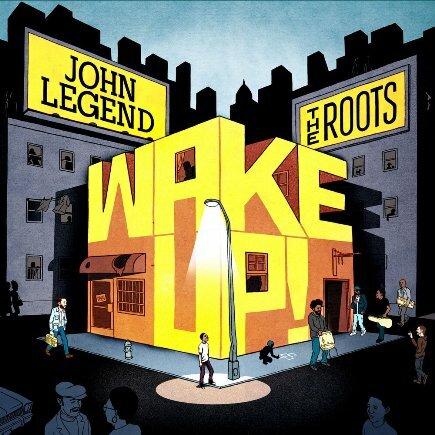 John Legend & The Roots | Wake Up! The year 2008 saw the resurrection of faith and hope in America. On that year, many saw themselves not only as citizens of a country but citizens of the world. People started joining together and saying, “Yes we surely can.” Others went a step further and asked, “What can I do and where do I start?” R&B singer John Legend answered that question by uniting with the great hip-hop group, The Roots. Inspired by the spirit and the political happenings at the time, the two started working together to resurrect 11 socially conscious soul songs from the 1960’s and 70’s. On September 21st, the dynamic duo can now say, “Yes we did” with the release of their 12 track album Wake Up. In the first single of the album, John Legend is joined by Melanie Fiona and Common to cover the song Wake Up Everybody that was originally performed by Harold Melvin and The Blue Notes. I wish the legend Teddy Pendergrass was alive to see his past influence the future once again. The first song of the album which happens to be my favorite is Hard Times by Baby Huey and the Baby Sitters. Many will relate to this song as they battle with the ‘less’ issues plaguing our nation today from jobless with the rise of unemployment to homeless with the rise of foreclosure. Bill Withers wrote the song I Can’t Write Left Handed after meeting a soldier at the end of Vietnam War. While you are listening to this song, think of the men and women who go to war so that we can sleep at night. A stranger walks up to them and shoots at them. Some live to tell the ordeal, others don’t. Without question, they serve when they are called to serve. What are you doing with the freedom that they have earned for us? Other songs featured in the album are Wholy Holy by Marvin Gaye, Little Ghetto Boy by Donny Hathaway, Hang On In There by Eddie Harris and Les McCann’s Compared to What. There is one original song in this album titled Shine written by John Legend for an upcoming documentary Waiting For Superman. The documentary directed by Davis Guggenheim comes out in October of this year and it is based on the issue of public education in the United States, an issue that John Legend is passionate about. Two years later, the euphoria of the elections has ended and the reality has set it. There are still many things affecting our country, our community and our households. Many songs on this album remind me of that. Many of you will buy this album. You will enjoy every track and will even relate to some of the songs. However, the main question is what will you do after? There is a message in every song. Wake Up everybody, the world will not get any better if we just let it be. The world will not get better over a tea party. We got to change the world, you and me.